These 4-brush sets offer artists a variety of high quality brushes for oil, acrylic and watercolor. The Velvetouch Brush Set includes Round 4, Long Round 8, Angle Shader 3/8" and Wash 1/4". 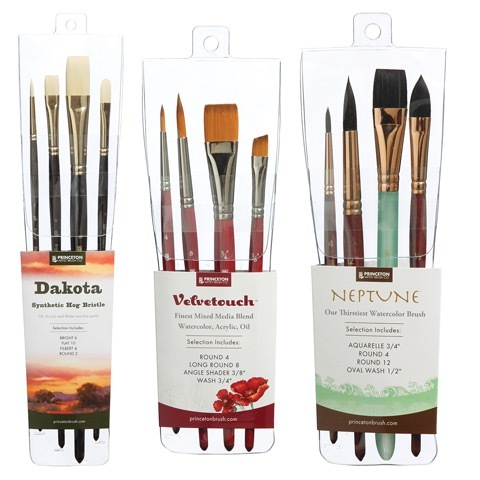 The Neptune Brush Set includes Aquarelle 3/4", Round 4, Round 12, and Oval Wash 1/2". The Heritage Brush Set includes Round 3/0, Round 3, Round 10 and Wash 3/4". The Elite Brush Set includes Angle Shader 1/2", Round 2, Round 8 and Wash 3/4". The Dakota Brush Set includes Bright 6, Flat 10, Filbert 4 and Round 2. The Summit Brush Set includes Bright 4, Flat 8, Filbert 6 and Round 1. The Aspen Brush Set includes Bright 4, Flat 8, Filbert 6 and Round 2. The Imperial Brush Set includes Angle Bright 6, Flat 10, Round 0 and Short Filbert 6.